I grew up in a split-level, the house style that dominated suburbia in the decades immediately following World War II. The middle floor—the one that “split” the upper and lower levels—was built upon a crawl space. You could get to it from a hole in the wall that was covered by a plywood panel, but as children we rarely ventured through. When my elderly parents sold the house a few years ago, it fell to me (with some help from my step son) to clean out the space before the new owners moved in, and I was reminded of what a creepy place it was. Batts of soggy fiberglass insulation hung haphazardly from the joists. Dim light filtered in from vents in the walls. There were some unpleasant signs of rodent activity and what looked like mold covering some of the joists. The damp concrete walls were as bare as when they were poured more than 50 years prior. In those days, common building practice was to insulate the floor above the crawl space and to leave the crawl space’s wall vents open, so any moisture buildup would vent to the outside—a monumental design flaw, as it turned out. Instead of expelling moisture (at least in climates with humid summers), the open vents allowed moist air in. As that air passed over the cool surfaces of the crawl space, condensation was left behind. At my parents house, fiberglass batts had degraded to the point of sagging and no longer kept cold air from reaching the floor above. It was no wonder Mom was always fretting about mildew ruining her rugs. 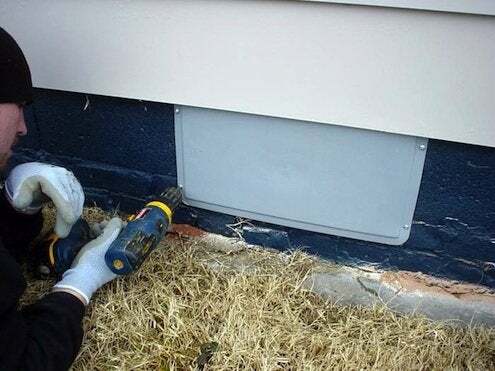 Today, energy experts have a different prescription for crawl spaces based upon the idea that they should be part of the home’s conditioned space (the area that is heated and cooled). If conditioned, then condensation is eliminated, which in turn minimizes the chance of mold and mites. Energy loss from air ducts is reduced, and first-level floors become warmer in winter. Drafts are also minimized. • Eliminate sources of water in the crawl space before doing anything else. Extend downspouts, maintain gutters, and regrade sidewalks, patios, and garden beds so that they slope away from the house. 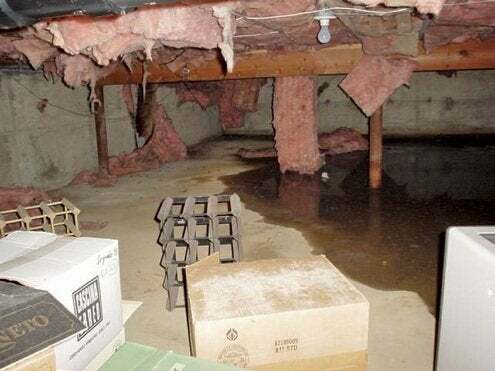 If necessary, install a basement waterproofing system or sump pump. • Insulate the walls, not the ceiling. Rigid boards may be installed with construction adhesive or mechanical fasteners. 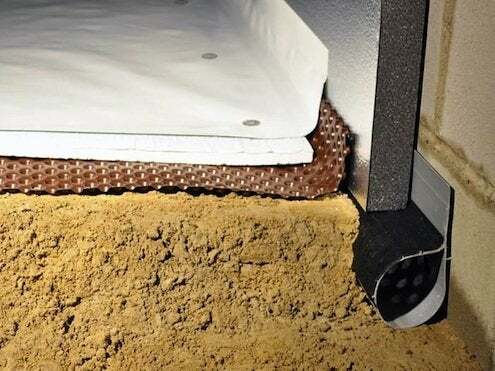 You may also choose to lay an insulating mat over the crawl space floor. • Use an insulation that resists damage from water (not fiberglass or cellulose). Any one of the rigid board insulations will work, but polyioscyanurate has the best R-value (6 to 7 per inch). Remainders and seconds are sometimes available from commercial roof insulation manufacturers. You just have to pick it up. • Seal all vent openings. Vent covers, installed from the exterior, are available in standard sizes. Or make your own from plywood and caulk them in place. • Ensure that hatchways to the exterior are sealed. Use heavy-duty weatherstripping to ensure a tight seal or purchase a pre-manufactured crawl space hatchway. • Seal rim joists and sills. Fill the ends of joist bays with rectangles cut from rigid board insulation. Use foam sealant, such as Great Stuff, to seal the joints. Use caulk or foam sealant to seal the joint between the top of the crawl space wall and the sill. • Install an air and vapor barrier over the floor and tape it to the insulation. Plastic vapor barriers are available in sheets of various thicknesses. If you plan to use the encapsulated space for storage, choose a barrier that will stand up to foot traffic. Many companies offer encapsulation services; in my opinion Basement Systems, Inc. has the most completely engineered system.